Jack Brabham's Car Care Cards. Homepage. This page: A set of car maintenance cards as endorsed by three-times F1 World Champion Jack Brabham, 1968. BMC 1100 - Jack Brabham's Car Care Cards. 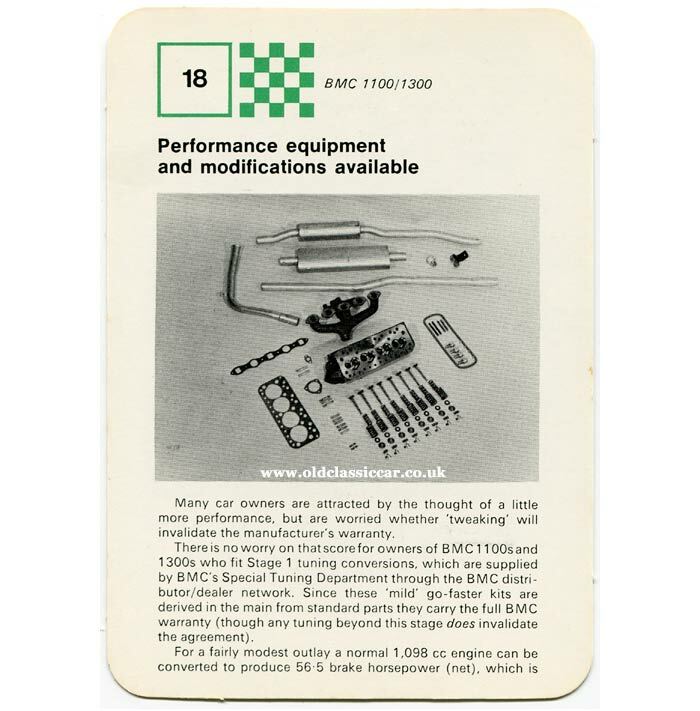 Various sets of these car maintenance cards were produced in the late 1960s, for popular cars such as Ford's Corsair and Cortina Mk2, the Morris Minor, Hillman's Super Minx, the Vauxhall Victor, and the set featured here, BMC's 1100 (design code ADO16) & 1300 in its many guises - Austin, Morris, MG and the rest. I doubt that three-times F1 champion Jack Brabham (later Sir Jack) personally spent many hours crouched over a typewriter, collating facts for these popular cars, however he put his name to the cards, at a time when racing drivers were becoming more aware of associating their name to products outside of Formula 1, whether for self-promotion purposes, financial gain, or whatever (the 1960s would also see the introduction of the Brabham Viva engine conversions, designed & engineered by Brabham to pep up the performance of the HB series of Vauxhall Vivas). 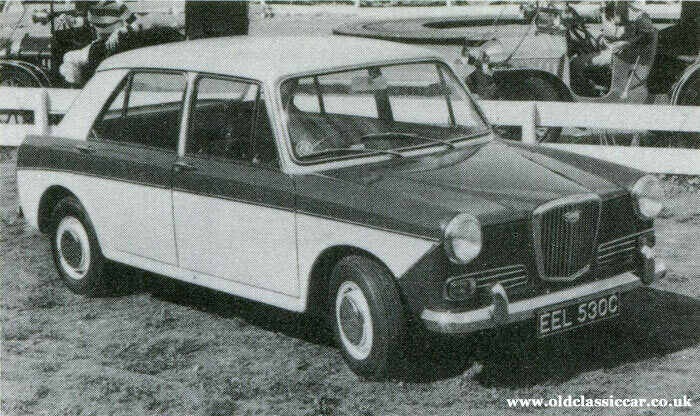 Austin 1100 reg. LOL 121F. Illustrating the cover of this pack is Austin 1100, registration LOL 121F. Curiously, a check of the DVLA site shows this registration as still active, but allocated to a 1622cc Austin in blue (presumably an A60 Cambridge), one that's not been taxed since 1980. This November 1967 registration was first used in the Birmingham area. Quite likely it was a number used by the factory, switched between a number of cars. Either that or the plate was screwed to the front of this 1100 for the photo, then returned to the A60 it came from. Although still showing as registered, I bet neither the F-registered Cambridge, nor the 1100 for that matter, are to be found tearing up the streets of Birmingham today. The cards were published by Card Publications Limited, of London SW11. The reverse of the outer packaging features a photo of "Black Jack" was he was often known, along with a brief biography of his achievements, his three world championship seasons (1959, 1960 and 1966) receiving due recognition, the third of which was behind the wheel of his own car, the first two driving Coopers. This pack of cards is dated 1968. 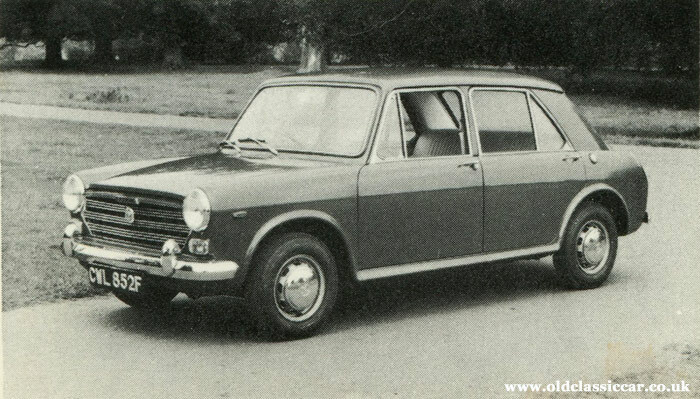 The set begins with a brief history of the 1100 & 1300 range, after which an overview of the cars' general specifications are given, while press photos of the different variations of 1100/1300 produced are dotted throughout the text. In fact the contents of the set reflect the usual advice, tips and maintenance regimes that you'd find in most workshop manuals of the day so barely need repeating here. Photographs of the different ADO16 variants. 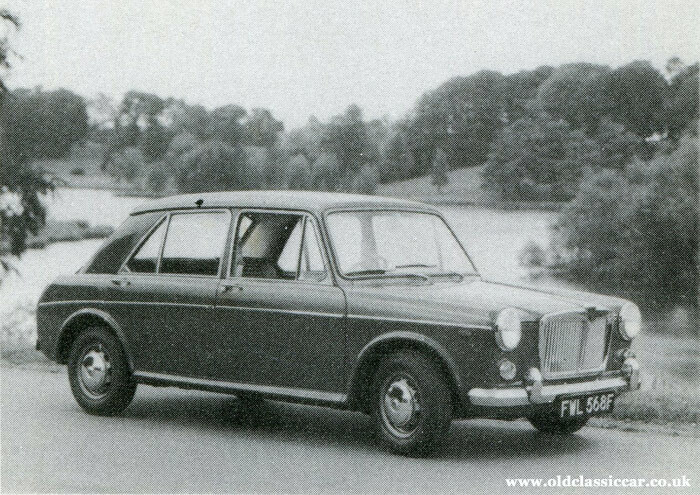 More interesting are the old press photos that accompany the servicing instructions, for the Wolseley 1100, Morris 1300, MG 1300, Wolseley 1300, and the Austin 1100, but no photo of the Vanden Plas version, nor the estates for that matter. Unsurprisingly, none of the registrations shown in the press photos show as 'live' any more. BMC Special Tuning Department kits. 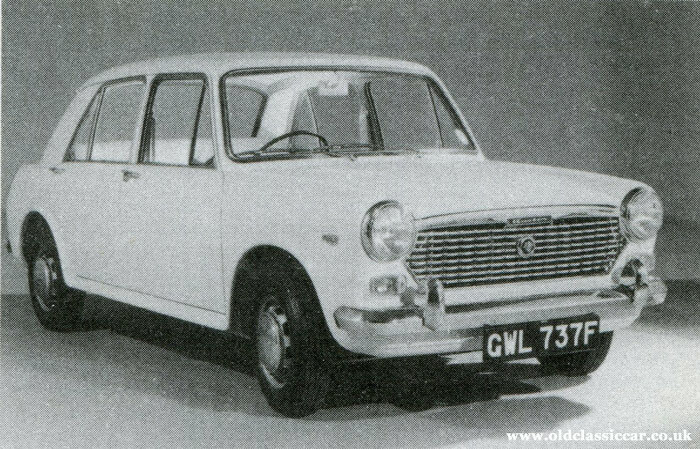 1100s and 1300s were available in a variety of different levels of trim and engine tune, from the single-carb Austin and Morris, to the twin-carb MG and (in manual form anyway) Vanden Plas. But every manufacturer's showroom-spec car is a compromise of performance, driveability, economy and reliability. Owners looking for more "oooompphh" from their car may well have found card number 18 of interest, enticingly titled "Performance equipment and modifications available". "Many car owners are attracted by the thought of a little more performance, but are worried whether "tweaking" will invalidate the manufacturer's warranty. "There is no worry on that score for owners of BMC 1100s and 1300s who fit Stage 1 tuning conversions, which are supplied by BMC's Special Tuning Department through the BMC distributor/dealer network. Since these "mild" go-faster kits are derived in the main from standard parts they carry the full BMC warranty (though any tuning beyond this stage does invalidate the agreement). 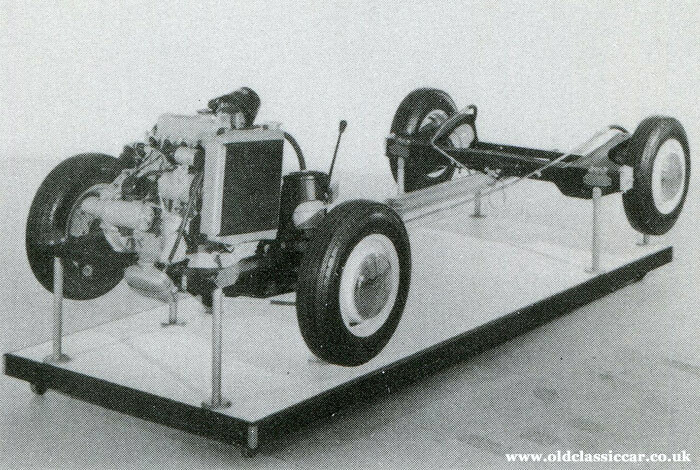 "For a fairly modest outlay a normal 1,098cc engine can be converted to produce 56.5 brake horsepower (net), which is an extra 8.5 bhp and compares very favourably with the 58 bhp obtained from the normal 1,275cc engine. The 1,275cc engine with this Stage 1 conversion pushes out 70 bhp, which is an extra 12 bhp. "These conversions have been developed in conjunction with Downton Engineering, a specialist firm who have had many years of collaboration with BMC and who have turned out some very successful conversions under their own banner. "Daniel Richmond, the brains behind Downton, is not concerned with producing bags of power at the expense of flexibility. These Stage 1 conversions concentrate on giving greater torque and efficiency. "These (sic) is nothing elaborate about the kits. The extra power and flexibility is gained through careful re-shaping of the cylinder head, ports and inlet manifold, and through a special exhaust system giving a freer flow. The compression ratio is stepped up to 9.25 to 1, and the kits include modified valves and valve springs, and sparking plugs. "The kits are supplied by BMC's Special Tuning Department to the distributor or dealer supplying the car, and they do the fitting (though you can in fact carry out the job yourself, and save the labour charge). "The kits have been carefully designed to give good torque at low engine speeds, and this makes for pleasanter driving as well as better performance. As an example of what this Stage 1 conversion achieves, BMC claim that it sends the top speed of a standard 1300 up from 86.8 mph to 91 mph, while the 0-30 mph time is cut from 5.1 seconds to 4.27 seconds, and the 0-60 mph time from 17.5 seconds to 13.8 seconds. "It is also claimed that the increased efficiency brings an improvement in fuel consumption of the order of 12-15 per cent. "And you can keep the original cylinder head so that it can be refitted when you sell the car." 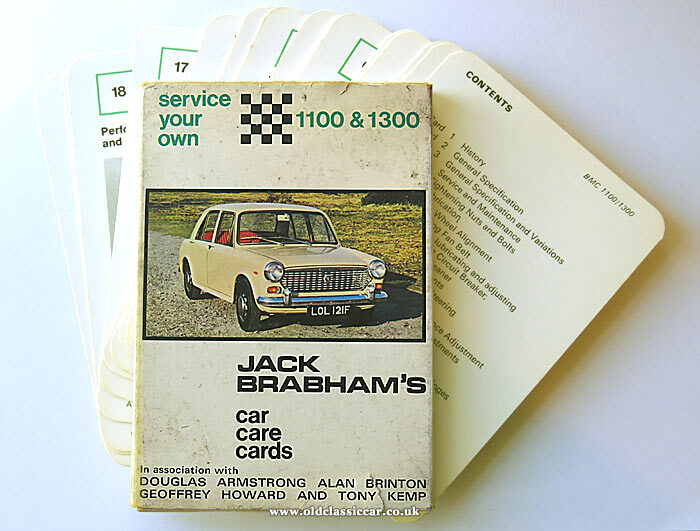 I wonder how many different "Jack Brabham's Car Care Cards" sets were produced, and was their publication just a one-off for 1968, or were further sets introduced in subsequent years? More period items relating to old vehicles can be found in the Motoring Collectables section of Old Classic Car. 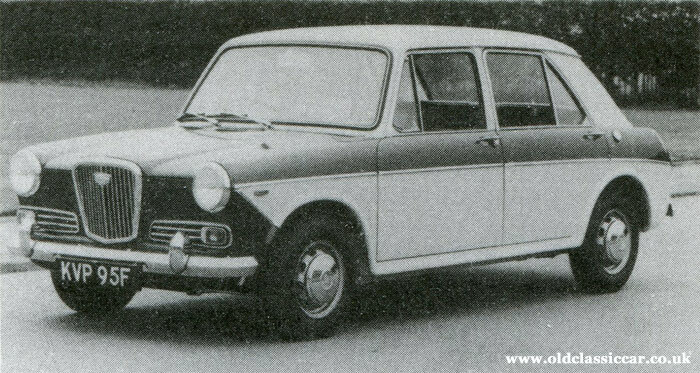 Period photos of the 1100 range can be found across this site, here for example are several period photographs of the Austin 1100. As for Jack Brabham references, check out this page which features Sir Jack and his "Redex Special" racing car.